what a contrast. 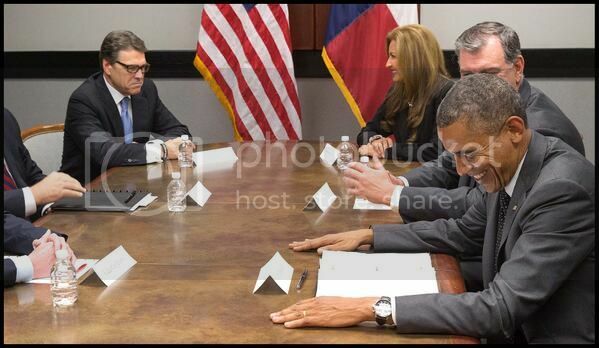 Perry looks like he just dumped in his pants. Our Pres. is relaxed, Perry is frozen in his outplayed grimace as he realizes he has been hoisted on his very own, very uncomfortable petard. Our President has a great sense of humor! Some things still make me smile. This made me smile. Something was FUNNY and Perry didn't think so.. The captions will write themselves. Guy on the left nearest to the camera has a really strained expression on his face. two thirds of the electorate ain't laughing. Are you a purity troll, or a Tea Partier? that picture is a thing of beauty all by its own self. I don't even care what caused it. I just love it. I can laugh at him, and do. I encourage you to do likewise, and as many others as care to join in. And mock him, insult him and lampoon him. 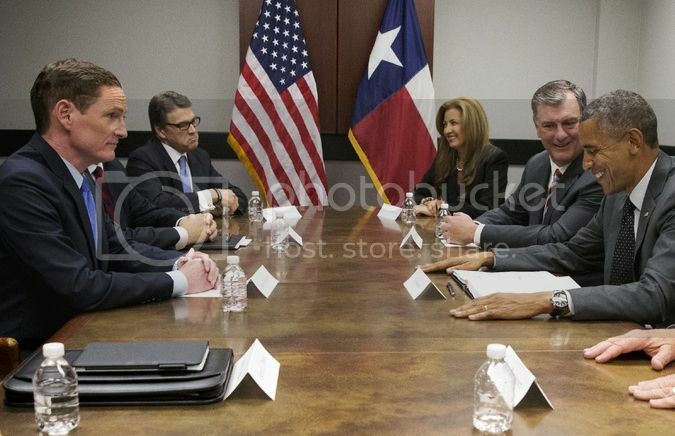 Publication of a pic where it appears the President of the US is doing so does not help us at all. Quite the opposite.